58% of consumers choosing an OTC pain reliever do not consider their pre-existing medical conditions1. 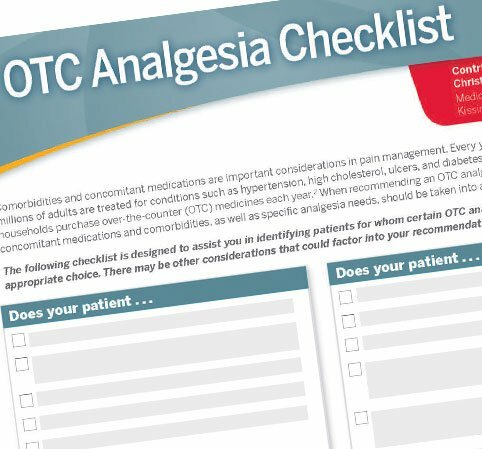 Your patients may not realize that their choice of OTC analgesic matters to their health. Below is a list of contraindications and potential drug interactions to consider before recommending naproxen sodium. It is not a substitute for the full OTC Drug Facts label. Patients should always read and follow the product label for additional product information. Patients age 60 and older and patients with existing GI risks who take naproxen sodium or any other NSAID are at increased risk for stomach ulcers, GI bleeding, and other serious GI problems. For patients with cardiovascular disease, taking a non-aspirin NSAID such as naproxen sodium or ibuprofen increases the risk for myocardial infarction and stroke2. For any patients taking a non-aspirin NSAID—including ibuprofen or naproxen sodium—the risk of heart attack, heart failure, and stroke increases. Patients are now urged to ask their healthcare professional before using OTC NSAIDs if they have had a stroke in the past. Patients are also encouraged to stop use and ask a healthcare professional if they have symptoms of heart problems or stroke, including chest pain, trouble breathing, weakness in one part or side of the body, slurred speech, or leg swelling. 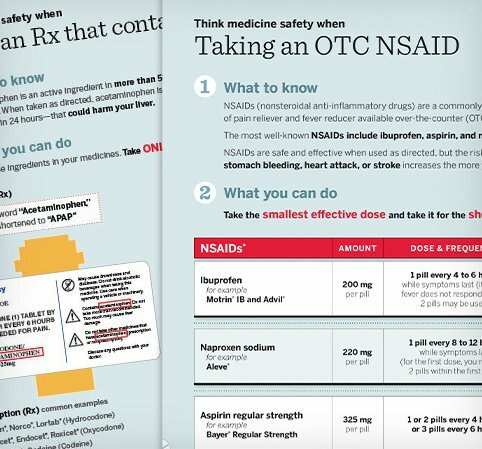 Click here for a visual of the updated NSAID label. NSAIDs, including naproxen sodium, may be associated with modest increases in blood pressure. The adverse effects of NSAIDs on blood pressure may be more clinically significant in the elderly, because the prevalence of hypertension, arthritis, and NSAID use is higher in this population4,5. For patients with existing kidney problems, taking naproxen sodium or other NSAIDs increases the risk of chronic kidney disease6. NSAID-related renal adverse events may depend on dosage and duration of therapy, and can include chronic kidney failure, reduced glomerular filtration, and nephritic syndrome7. Naproxen sodium and other NSAIDs are metabolized in the liver and can pose risks for patients with hepatic dysfunction8. In some adult patients who have asthma, naproxen sodium and other NSAIDs that inhibit COX-1 can worsen the condition9. More than 900 OTC and prescription medicines contain an NSAID. Taking naproxen sodium in addition to frequent chronic use of other NSAIDs can increase the risk of GI bleeding, cardiovascular problems, and other serious side effects2. Taking naproxen sodium or any other NSAID at the same time as low-dose aspirin can increase GI bleeding risks5. Co-administration of anticoagulants and NSAIDs such as naproxen sodium can increase the risk of GI bleeding. Antiplatelet medications pose GI bleeding risks, which may be compounded by use NSAID use5,10. For patients on corticosteroid regimens, taking naproxen sodium or any other NSAID increases the chance of severe stomach bleeding. This may be due to steroids reducing gastric mucus production, which can delay healing of NSAID-induced erosions11,12. Naproxen sodium and other NSAIDs may be associated with modest rises in blood pressure. NSAIDs may blunt the effects of common classes of antihypertensive medicine, including diuretics4. If individuals consume three or more alcoholic drinks daily while taking naproxen sodium or another NSAID, the risk of GI bleeding is increased. Naproxen sodium temporarily relieves minor aches and pains due to muscular aches, minor pain of arthritis, headache, backache, toothache, the common cold, and menstrual cramps, and temporarily reduces fever. Patients may not realize that certain OTC pain relievers can have health consequences, based on their health conditions and other medicines they take. They also may not know that naproxen sodium is an NSAID. Check the active ingredients in all medicines they take. Look for “NSAID” on labels. Take ONLY 1 medicine that contains an NSAID at a time. If they’re not sure which pain reliever to choose and how to use it, consult you or another healthcare professional first. When taken as directed, naproxen sodium can provide safe, effective pain relief. Choosing an OTC pain reliever carefully—and using it as directed—is important to their health. References: 1. U.S. Pain Foundation. One in five Americans do not consider any key safety factors when choosing over-the-counter pain relievers [press release]. Fort Washington, Pa: PRNewswire/USNewswire. August 29, 2016. 2. Antman EM, Bennett JS, Daugherty A, Furberg C, Roberts H, Taubert KA. Use of nonsteroidal anti-inflammatory drugs: an update for clinicians: a scientific statement from the American Heart Association. Circulation. 2007;115(12):1634-1642. 3. Food and Drug Administration. FDA strengthens warning that non-aspirin nonsteroidal anti-inflammatory drugs (NSAIDs) can cause heart attacks or strokes. Safety Announcement. July 9, 2015. https://www.fda.gov/Drugs/DrugSafety/ucm451800.htm. Accessed May 31, 2017. 4. Calhoun DA, Jones D, Textor S, et al. Resistant hypertension: diagnosis, evaluation, and treatment. A scientific statement from the American Heart Association Professional Education Committee of the Council for High Blood Pressure Research. Hypertension. 2008;51:1403-1419. 5. Bhatt DL, Scheiman J, Abraham NS, et al. ACCF/ACG/AHA 2008 expert consensus document on reducing the gastrointestinal risks of antiplatelet therapy and NSAID use. Circulation. 2008; 118(8):1894-1909. 6. National Kidney Foundation. Pain medicines (analgesics). https://www.kidney.org/atoz/content/painmeds_analgesics. Accessed May 19, 2016. 7. Decloedt E, Maartens G. Drug-induced renal injury. CME. 2011;29(6):252-255. 8. Chandok N, Watt KDS. Pain management in the cirrhotic patient: the clinical challenge. Mayo Clin Proc. 2010;85(5):451-458. 9. Peterson GM. Selecting nonprescription analgesics. Am J Ther. 2005;12:67-79. 10. Risser A, Donovan D, Heintzman J, Page T. NSAID prescribing precautions. Am Fam Physician. 2009;80(12):1371-1378. 11. Guslandi M. Steroid ulcers: any news? World J Gastrointest Pharmacol Ther. 2013;4(3):39-40. 12. Hernández-Díaz S, García Rodríguez LA. Steroids and risk of upper gastrointestinal complications. Am J Epidemiol. 2001;153:1089-1093.